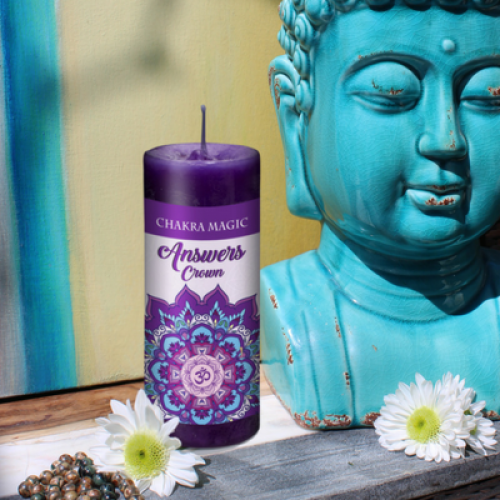 Answers Chakra Magic candle is Violet, 2" dia. x 4.5" tall, 40 hours burn time. Spicy temple scent of Frankincense, Jasmine, myrrh and a touch of Lemongrass will help open and balance the crown chakra so answers to your questions come in less filtered and more easily heard. When you say, "omg, I need a miracle" it's time for a crown chakra shift with a chakra magic candle to get your answers. Answers Chakra Magic Mantra I open up to the beautiful gifts a connection to the divine brings. With every breath I take, I feel the peace. With every breath I take I know there is wisdom here for me. With every breath I take, I understanding my life’s purpose better. With every breath I take, my accept my part in the universe willingly.